BEAUMONT, Texas– An East Texas jury has completely cleared a Beaumont motel accused of negligence by a woman who claimed a self-closing pool gate injured her ankle. Plaintiff Donna Rudolph was staying with family at the Americas Best Value Inn in August 2012, when she claimed the pool’s self-closing gate hit her ankle. She said the injury prevented her from working again as a pipefitter, and she filed a premises liability lawsuit seven months later seeking $600,000 in damages. Attorney Taylor Freeman, an associate at Houston-based Ahmad, Zavitsanos, Anaipakos, Alavi & Mensing P.C., or AZA, worked as counsel for defendant Ganesh Inc., which does business as Americas Best Value Inn. Mr. Freeman showed the jury that the gate had been in operation for 15 years with no problems and that it met state safety requirements calling for a self-closing gate equipped with a low-bar to prevent children from climbing underneath. Ms. Rudolph, 52, said the low bar caused the injury to her ankle. During the recent four-day trial, Mr. Freeman showed the only medical attention Ms. Rudolph sought for her ankle came after she filed the lawsuit in April 2013, roughly seven months after she claimed she was injured. The jury deliberated less than an hour before delivering a complete defense verdict clearing the motel of all claims brought by Ms. Rudolph. The trial was held in Judge Gary Sanderson’s 60th State District Court in Jefferson County. The case is Donna Rudolph v. Ganesh Inc., dba Americas Best Value Inn, No. B-0194239. Ahmad Zavitsanos Anaipakos Alavi & Mensing P.C., or AZA, is a Houston-based law firm that is home to true courtroom lawyers with a formidable track record in complex commercial litigation, including energy, intellectual property and business dispute cases. 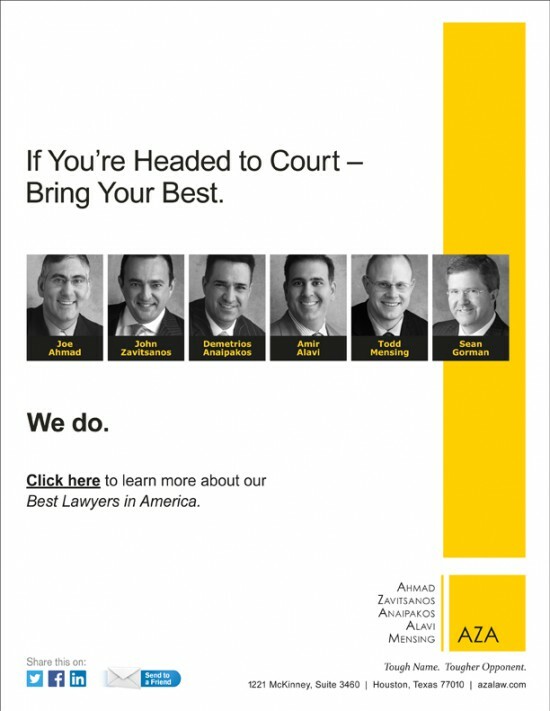 AZA is recognized in Chambers USA 2016 among the best in Texas commercial law; U.S. News & World Report and The Best Lawyers in America as one of the country’s best commercial litigation firms; Texas Lawyer as the 2015 Litigation Department of the Year and Law360 as a Texas Powerhouse law firm. National corporate counsel named AZA both one of the country’s best in client service and one of the most feared. Read more at https://azalaw.com/.